Due to low specific weight, good mechanical properties, low young modulus, very good strain-controlled and notch fatigues resistance, high strength-to-weight-ratio, superior corrosion resistance, etc., titanium (Ti) and its alloys lead on the utilization of biomedical and dental implants [1-4]. The Versatility of Ti and its alloys is from three categories it’s normally found from: α, (α+β) and β phases [5, 6]. Within these categories, different problems exist. Ti6Al4V (α+β phases) has a complexity of toxicity elements which release into the body fluid during their applications as implants [7-9]. In particular, aluminium (Al) and vanadium (V) release lead to inflammation and cytotoxicity in the surrounding tissue of implants. In fact, an accumulation of metallic ions in body fluid causes hypersensitivity and thrombogenesis, and these consequent to implant loosening. The worst consequence of ions release into the body entails difficulties such as revision and/or removal of implants [9-12]. 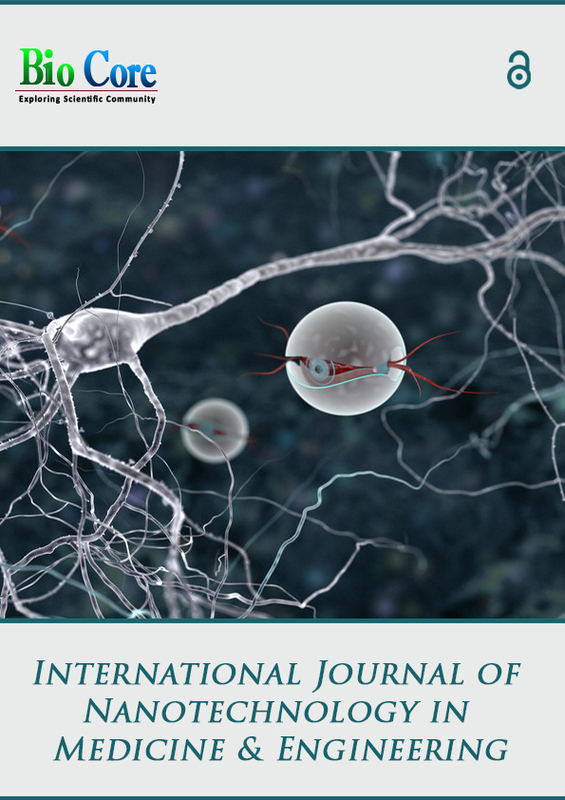 In avoidance of toxicity elements release into the blood fluid, Ti6Al7Nb has subsequently been developed ,,[15, 16]. Corrosion measurements for pertaining to wimplant usage has previously being done by numerous authors, and different findings have been documented,,,. Furthermore, in consideration of localized corrosion occurrence which goes with non-uniformity pH around implants, varying electrolyte conditions have been found to play a critical role on the lifespan of the implant. Fojt et al. utilized corrosion measurements on the characterization of porous Ti39Nb using phosphate-buffered saline solution as an electrolyte. It was found that porosity above certain limit could cause localized corrosion. With an utilization of Ringer solutions at different pH corresponding to severe conditions human body experiences due to surgery, infections and inflammations, Calderon Moreno et al. provided in roads through utilization of electrochemical measurements. Most of all, fluoride which is normally used in toothpaste were found to be problematic at certain concentration [23-25]. Metal injection moulding (MIM) as the state-of-art powder metallurgy manufacturing technique which produces alloys on a mass production of complex small-medium parts has got quite a number of advantages over conventional manufacturing techniques which can be found elsewhere  [19, 27]. On the research of the components fabricated by MIM, most authors studied and reported on mechanical properties, chemical and biocompatibility properties of newly improved materials [26, 28-36]. However, there are no corrosion measurements, particularly, on deeper characterization of passive layer which forms on Ti6Al7Nb manufactured by MIM when it’s exposed dynamic conditions for dental usage. The present study engaged for corrosion measurements to focus on the empirical occurrence of localised corrosion on Ti6Al7Nb manufactured by MIM processes when it is used for dental applications. Materials and Solution: Ti6Al7Nb specimens manufactured by MIM were provided in dimensions of 2cm2. The Standard electrolyte used in this work was Fusayama-Meyer artificial saliva, and the composition was synthesized from the following chemical powders: NaCl (0.4 g/L), KCl (0.4 g/L) CaCl2 . 2H2O (0.796 g L1), NaH2-PO4 . 2H2O (0.690 g/L), Na2S . 9H2O (0.005 g/L) and Urea (1 g/L). The saliva simulating electrolyte (SSE) was prepared using deionised water with a resistivity of 18.2 MV cm. Certified reagents supplied by Alfa Aesar, USA. NaF (Sigma Aldrich, USA) was added to the artificial saliva solution to simulate different fluoridate media, and it was varied up until a critical concentration was obtained. As based from the literature, for the simulation of the plaque conditions, sulphuric acid (H2SO4) was used to lower the pH of the pure SSE to 3.0, while the peroxide solutions in SSE (0.1% and 10%) were obtained following steps that can be found elsewhere [37, 38]. Electrochemical Measurements: An electrochemical cell with three imperative openings was used in this study to simulate localized corrosion occurrence on bare Ti6Al7Nb in the dynamic SSE. Three openings were for engaged electrodes: a working electrode (Ti6Al7Nb), a platinum wire (counter electrode) and 3M Ag/AgCl as a reference electrode. The whole setup was computerized from advance autolab PGSTAT302 N potentiostat. Prior to any electrochemical measurement, the OCP was run at room temperature for at least 2 hrs. After OCP measurements, Potentiodynamic polarization (PDP) and Electrochemical impedance spectroscopy (EIS) measurements were carried out. Firstly, the potential of 250 mV was scanned in the reverse direction (cathodically polarized) to remove oxide which formed on the surface of the LCS electrode during an attainment of steady-state conditions under OCP. Secondly, the anodic and cathodic curves were measured at the scan rate of 0.16mV/s; starting from -1 V to 1.5 V.
For EIS measurements, NOVA 2.0.1 software was utilized. The Measurements were carried out at OCP over a frequency scan ranging from 100 kHz to 100 mHz. The wave type was single sine at an integration time of 0.125s per cycle and the amplitude used was 10 mV. Ultimately, after an acquisition of EIS spectra, an electrical equivalent circuit (EEC), which was attained through Boukamp model, was utilized to interpret the EIS data. For reproducibility of the results, all the electrochemical measurements were triplicated. Surface Characterization: Scanning electron microscopy (SEM) coupled to energy-dispersive spectroscopy (EDS) was used to inspect the surface phase morphologies and elemental compositions of the engaged samples. The used SEM was JEOL JSM electron microscope, and it was operated at 20 kV. Corrosion Measurements results: Fig. 1 below shows the OCP curves for all engaged Ti6Al7Nb electrodes in the dynamic SSE used in this study. As can be seen from the Figure, the OCP for 0.1 % H2O2 is more positive than the other OCPs. This could be due to a momentary oxidization which occurs on the surface of the electrode. In comparison with the higher content (10% H2O2), an exhibition of more negative CP potential can be seen in Fig. 1. Furthermore, it can also be seen that increasing of the fluoride content and existence of plaque condition led to OCP values shifting from noble values. This could be due to an aggressive effect on the passivation layer of Ti6Al7Nb within those electrolyte media [39, 40]. On the other hand, Fig. 2 shows PDP curves, and it was intended to characterize the corrosion behavior of Ti6Al7Nb in engaged SSE conditions. As can be seen in Fig. 2, Ti6Al7Nb shows active-passive behavior as it starts reacting with electrolyte under all engaged conditions. As time goes on, it forms a compact passive layer which prohibits further active transition, particularly under pure SSE. 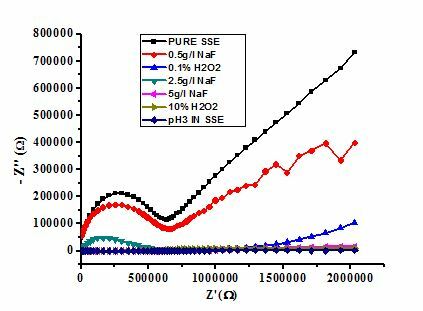 However, with inclusion and increment of fluoride concentration, anodic curves deviate a bit from noble region, and the critical concentration was found to be 2.5 g/l NaF. An initial introduce of peroxide (0.1% H202) shited corrosion potential to the more electropositive value, and shift anodic curve to the noble side as can be seen in Fig. 2. As H2O2 is a strong oxidizing agent, in its initial impact it thickens the oxide layer and increases cathodic current . In contrast, when 10% H2O2 was applied, the potential and current density increase rapidly. This could be due to defects which are created on the oxide layer by the presence of peroxide in the SSE . Even for the 0.1% H2O2, it is known that the observations are attributed only to a short period of time which H2O2 inclusion was exposed to Ti6Al7Nb. On the previous study where H2O2 was exposed to Ti alloy, it was realised that it becomes worst as time goes on. 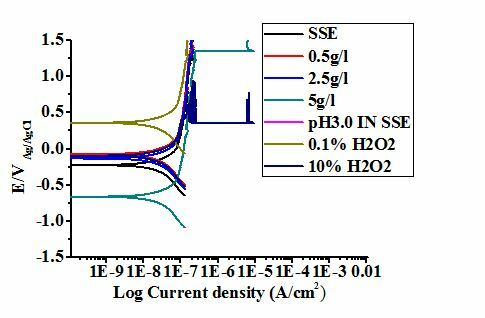 On the other SSE modification, it was observed that maximum rapid corrosion occurs under plaque conditions (SSE modified to pH 3.0 by H2SO4). That is evidenced by quazi-broken oxide layer and a higher current density as can be seen in Fig. 2. 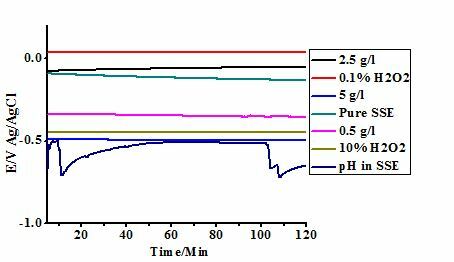 Figure 2: PDP curves for Ti6Al7Nb in different SSE conditions: Pure SSE, 0.1% H2O2, 0.5g/l NaF, 2.5gl NaF, 5g/l NaF and pH 3.0 in pure SSE (plaque condition). PDP observations were furthermore corroborated by EIS Nyquist diagrams shown in Fig. 3. On a deeper analysis of the diagrams, it can be seen that the semicircles became more compressed when fluoride concentration increases and under severe plaque condition in SSE. This is the exact view that was observed in previous studies , and it is attributed to the acidified conditions which became involved therein. In Fig. 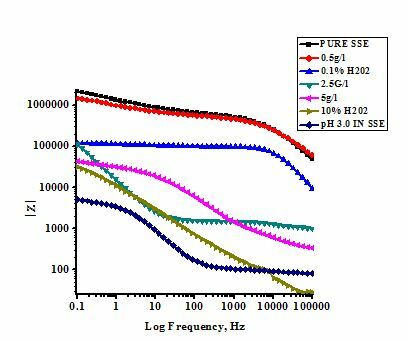 4, a higher impedance values were noted at low frequency for pure SSE and 0.1% H2O2. This once again proves the negative impact of higher fluoride concentration on Ti6Al7Nb. Higher fluoride concentration has been reported to lower corrosion resistance of implants alloys , and the findings herein are consistent with the previous studies. Most importantly, for engaged Ti6Al7Nb from novel fabrication method (MIM), the fluoride content of about 5 g/l noticed to be critical. In Fig. 5, a constant phase angle curve can be seen at a low-frequency range in Fig. 5 (i), and that shows an intact passive layer which is anticipated to alloys which are used for implants [43, 44]. For this study in particular, the intact oxide layer underneath obviously porous layer (TiO2) is Nb2O5, and it is shown in Fig. 6. However, as other conditions are introduced, the phase angles started to decline within the intermediate frequency range, and that is attributed to the dissolution of oxide layers . Figure 3: EIS Nyquist diagrams for Ti6Al7Nb in different SSE conditions : Pure SSE, 0.1% H2O2, 0.5g/l NaF, 2.5gl NaF, 5gl NaF and pH 3.0 in pure SSE (plaque condition). Figure 4: EIS bode impedance plots (|Z|)for Ti6Al7Nb in different SSE conditions : Pure SSE, 0.1% H2O2, 0.5g/l NaF, 2.5gl NaF, 5g/l NaF and pH 3.0 in pure SSE (plaque condition). Figure 5: EIS bode phase plots (˚) for Ti6Al 7Nb in different SSE conditions: (i) Pure SSE, (ii) 0.1% H2O2, (iii) 0.5g/l NaF, (iv) 2.5gl NaF, (v) 5gl NaF, (vi) pH 3.0 in pure SSE (plaque condition). Surface morphologies: Fig. 7(a) to (g) show surface morphologies of Ti6Al7Nb alloy when exposed to aforementioned electrolytes engaged in this study. Vividly, intact oxide layer can be seen when Ti6Al7Nb alloy exposed to pure SSE. The morphology is composed of black and white parts as can be seen in Fig. 7a. The observation revealed alloying elements (Al and Nb) to the titanium, and this shows negligible occurrence of the degradation . On 0.5 g/l NaF and 0.1% H2O2 usage as electrolytes, a uniform corrosion oxide products can be seen all over the surfaces (Fig 7(b) and (c)), and that shows mild corrosion reactions on the surface of Ti6Al7Nb from the engaged electrolytes . In opposite, when the alloy was subjected to further fluoride concentrations (2.5 and 5 g/l), aggressive surface degradation occurred on the surfaces as can be seen in Fig. 7 (d) and (e). Most notably, when the peroxide concentration was increased to 10% and under plaque conditions, aggressive surface degradation became apparent as can be seen in Fig. 7(f) and (g). All these are in agreement with previous analysis and some reported work that higher fluoride concentrations, the existence of peroxide and plaque conditions are toxic to the alloys surfaces used for implants , and Ti6Al7Nb fabricated by MIM is no exception as well. 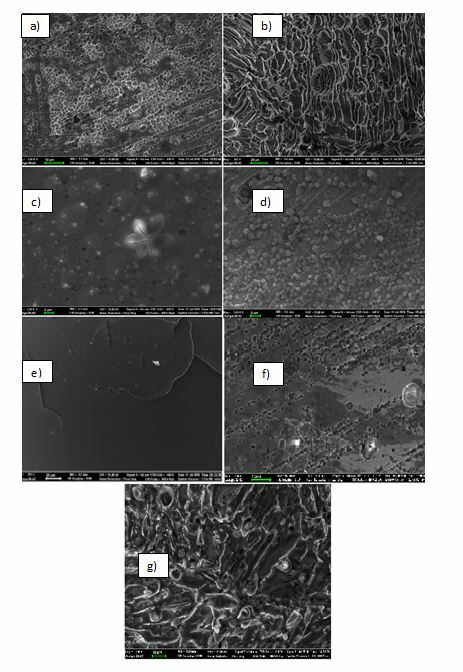 Figure 7: SEM surface morphologies for Ti6Al7Nb under dynamic SSE Two layers: a) Pure SSE ,b) 0.5 g/l NaF, c) 0.1% H2O2, d) 2.5 g/l, e) 5 g/l, f) 10% H2O2, g) SSE at pH 3.0. Corrosion behavior of a Ti6Al7Nb alloy, when is used as a dental implant, has been characterized in this study. From various dental application exposure, the following conclusions were drawn: Excellent passive layer forms when Ti6Al7Nb is exposed to pure simulating saliva electrolyte (SSE). The increase of the fluoride concentration increases corrosion potential and corrosion kinetics, and the critical fluoride concentration was 5g/l. Peroxide at smaller concentration causes corrosion potential to shift to the electropositive value, while the higher concentration lowers stability of the anodic passive layer forms on Ti6Al7Nb. A simulated severe plaque formation (SSE lowered to pH 3.0) causes the most accelerated corrosion rate on Ti6Al7Nb alloy. Electrochemical impedance spectroscopy (EIS) measurements revealed a capacitive behavior with formation of two oxides layers (porous oxide and dense-compact oxide layer). 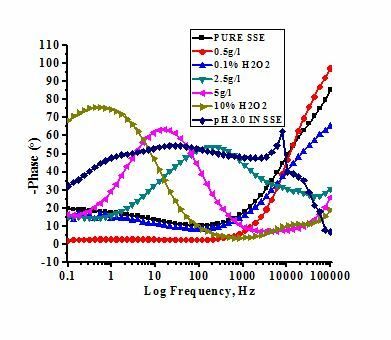 Furthermore, high phase angle and impedance were noted at low and intermediate frequencies for pure SSE, but opposite occurrences were observed under dynamic modified SSE.